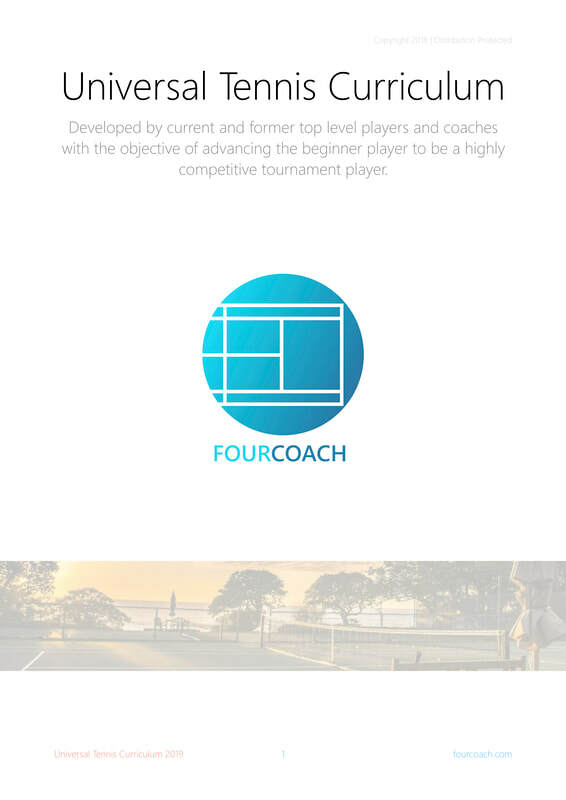 Every outcome and progression within the FourCoach curriculum comes from an educated and experienced tennis perspective, however it does not purport to be the only possible linear progression for a tennis player to adhere to. We believe in the curriculum we've collaboratively created, however we respect the many varied opinions of best practice that exist within the global tennis community. How can this curriculum help you? 1. Do you and your fellow coaches have a lesson plan for each lesson? 2. Are you able to have individual goals and markers when coaching a group lesson? 3. Do your lessons have the same structure, every time? 4. Do you give your students and parents feedback regularly? 5. If a new coach started tomorrow, would they know what each student could and couldn’t do? 6. Is the life of a student at your centre less than two years? 7. Do students reach a point where they need a ‘better’ coach to help them continue to develop? 8. Do you consider the standard of the competitions you run to be strong? 9. Do many of your students play and have success in local, state and national tournaments? 10. Do you forecast generational loyalty to your tennis centre? The FourCoach team traveled around the state and the country for close to two years, observing various coaches and their programs. Alarmingly, almost all of the coaches observed did not engage in any formative (ongoing observational) or summative (end of term/month/year) assessments for their students. Additionally, these same coaches observed ran almost identical lesson structures for group and private coaching apart. While a very large proportion of coaches and centres had high levels of enthusiasm and passion for the game, and while many had formal coaching qualifications, many were experiencing student turnover of less than 18 months. Also of note was that a small percentage of coaches were holding onto (and developing) elite players almost exclusively, and the large majority of coaches had students experiencing little success or even exposure to wider and higher levels of competition. For many, the greatest levels of player engagement were seen during informal games played within coaching lessons and while these were fun and developmental, they weren’t doing a great deal to individualise tuition or get players to the higher stages of performance. 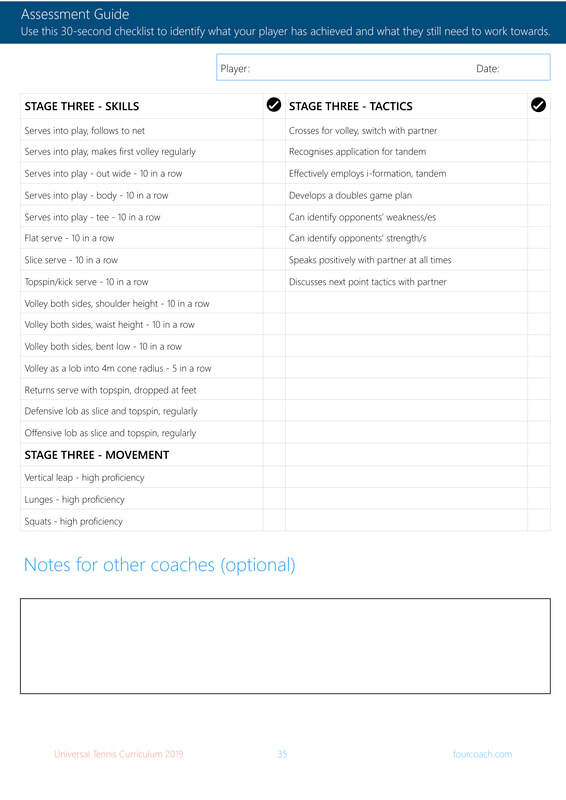 Only a very small handful of coaches nation-wide actually started a lesson with a series of individual goals and targets for players along with the drills, activities and games that would help them achieve. Most coaches see group lessons as a way for students to develop a love for the game through social interactions and games. They are a highly engaging, yet affordable and manageable way for new players to try the game out and to learn the basics. None of this ever needs to change, however it was the viewpoint of many coaches interviewed that time constraints and class management were the biggest hurdles to having individual learning needs met during group lessons. The most effective group lesson structures observed were those where grouping was flexible and timetabled to be convenient. Groups were loosely organised with age in mind but the more defining features of group composition were development focus, skill level, experience and cans/can’ts. For most coaches, the long-held paradigm is that students should turn up to every lesson and receive exposure to all of the general shots in the game until the lesson is over. Coaches learn to understand the little aspects of each shot that players need to work on, eg ‘Sally needs to turn her shoulders more in preparation for her backhand’, and ‘Zhang needs to shorten his backswing on his forehand volley’. These mental observations generally stay at the forefront of that particular coach’s mind. But there is a growing need to see each player as an individual who favours various aspects of his/her game and needs further development on other aspects. Remaining rigid to a set format where all shots have the same amount of time and focus can result in a growing disparity between stronger and weaker shots as well as possible disengagement. Not all students and parents are the same. Some students and parents will enrol in tennis programs just in the name of a bit of fun. Some parents just want a bit of time to sit and unwind. But for many parents, there is a definite need to see tangible results or some measure of progress in return for dollars spent. Most people are relatively understanding of the fact that player development happens at different speeds, but as a way of promoting loyalty and longer engagement in programs, getting into a habit of communicating what players have achieved and what they’re working towards achieving next is incredibly beneficial for business. Almost all coaches interviewed and observed were able to articulate areas of strength and weakness in the players they trained. 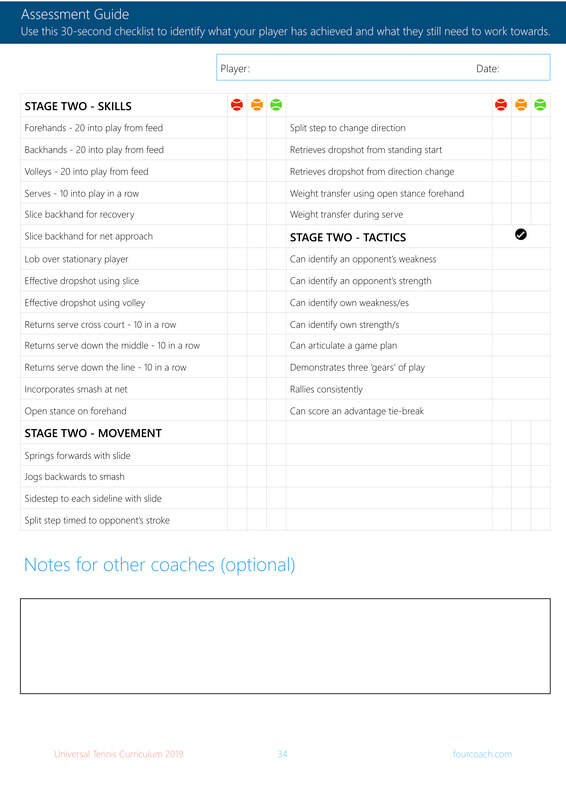 Going one step further and having a quick and straight-forward way to keep track of player development would result in better communication among coaches and a better understanding of areas of improvement for the whole tennis centre. Students can come and go and there aren’t many recognisable indicators as to how long they’ll stay with you, their coach. For some, tennis is taken up with the expectation to become masters very quickly. When that goal isn’t realised for whatever reason, players often leave the game and take up another sport or hobby. For others, tennis is tied to happiness. As a student engaged in lessons that are fun, they’ll do well. But many burn-out stories will show that when a player starts to have success, motivation to play is then tied to whether or not they’re winning. For a player with glaring holes in their game, or for someone who had some quick successes without following a natural progression, it will be easy to meet many physical and mental barriers. As a coach but also a business owner, it is important to help every player reach their goals and their potential but also to ensure that players continue to come back to your centre, whether it be for coaching or to play in your competitions and tournaments. Adhering to a straight-forward curriculum that ensures that players don’t develop while some skills remain stagnant can be engaging and ensure players stay in the game for longer. If you spend a great deal of time progressing a player from beginner level through to playing in competitions with barrier weaknesses, it’s natural that they may feel they need to look elsewhere to address those inconsistencies with another coach. That is not good for business and that is not good for players. 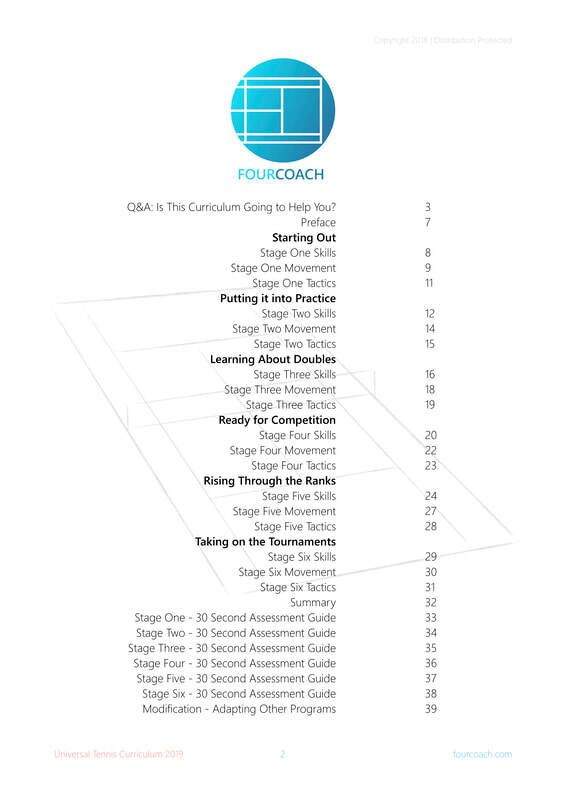 The FourCoach curriculum is staged in such a way that players should achieve particular levels of competency and mastery before moving into competitions and tournaments. 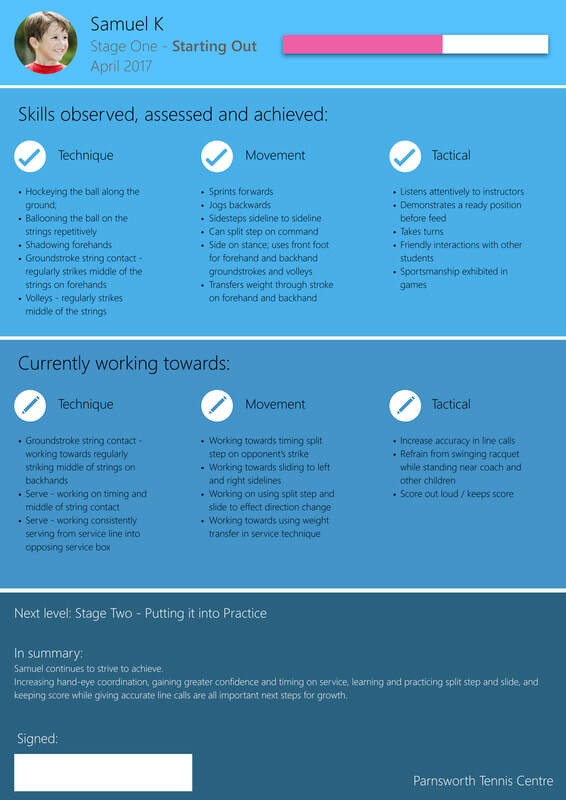 Each stage needs all aspects to be achieved before progressing and this ensures that certain shots, tactics, mental processes and movements aren’t overlooked or abandoned along the way. A great way to keep students engaged at your centre is by running regular competitions that are challenging but also have attainable achievements. Having one-dimensional competitions with tired formats or competitions with a very wide variance of player ability is a quick way to see players dropping out. The better players won’t feel challenged and the players with lots of weaknesses won’t be improving from getting wiped off the court. 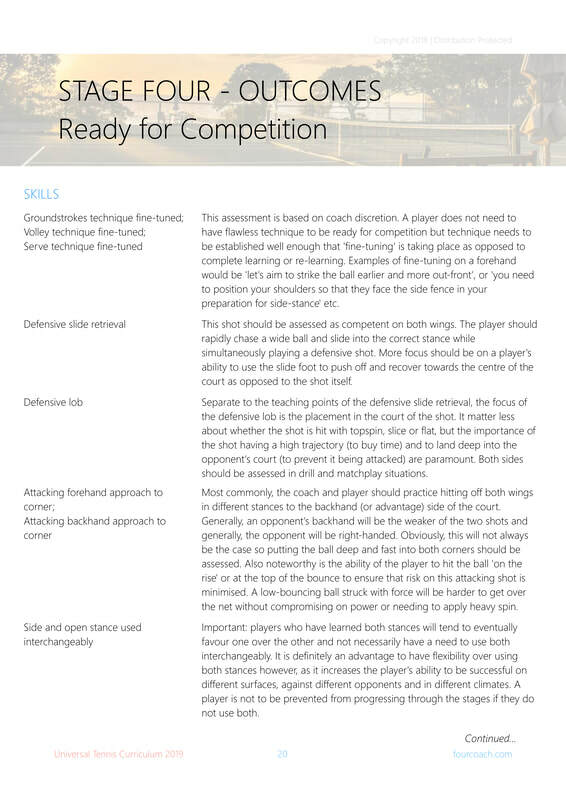 Having several different tiers and flexible format competitions is the best way to continue to develop your players as well as seeing them remain loyal and playing at your centre. At nearly all of the centres we visited, coaches would be able to list a very small handful of players who were competing at high levels with success. The large majority of players at their centres were fumbling their way through local competitions and turning up to coaching to ‘go through the motions’. 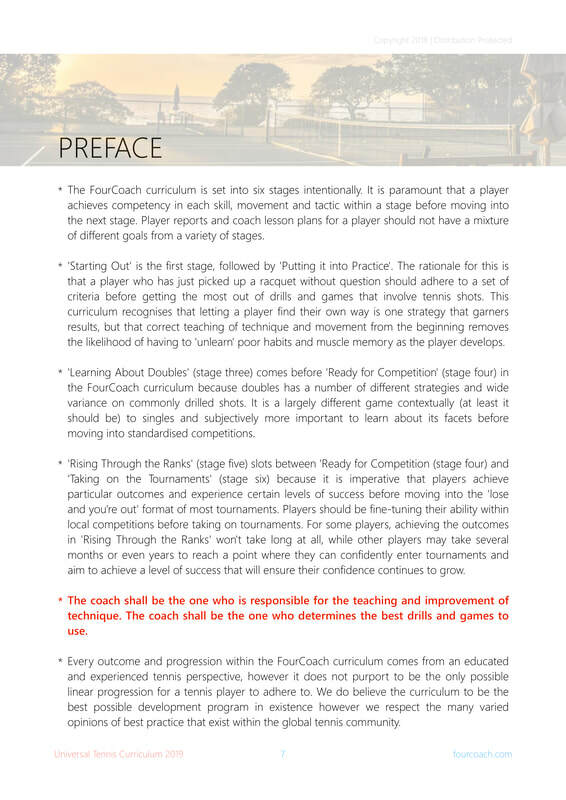 The FourCoach curriculum is staged in such a way that a player must demonstrate certain competencies as well as a tangible win/loss ratio to be encouraged into the more challenging competitions and tournaments. Generational loyalty to a centre is the ultimate goal for a business owner. Seeing a student go from being a beginner through to being a complete player and then either referring a friend, family member or even offspring is incredibly rewarding. Having attainable goals, an easy to understand progressive curriculum, individual lesson focuses, communication with players and families and good levels of communication among different coaches at the same centre will all contribute to positive word of mouth and repeat business.